On the hunt for a missing two million dollars in cash, some evil baddies end up massacring a man’s family while attempting to get a hold of the money. Unfortunately for them, it was Joe (Kim)’s family. Traveling from San Francisco to Colorado in the hunt for answers, or maybe some revenge if time allows, Joe ends up running afoul of the cruel and sadistic sheriff of the town and his minions, but also finds a sympathetic partner in the inexplicably named Oggie (Shapiro). It appears the stage is set for the ultimate battle…where will Joe draw the (Kill) Line? 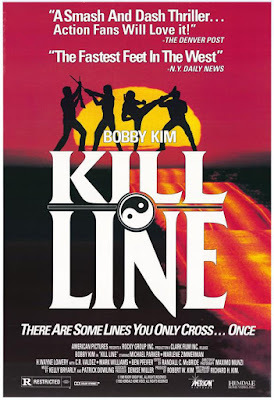 Taking its cue from First Blood (1982), and highly redolent of the Thunder series, Kill Line is very sincere and earnest…to a fault. It takes itself so seriously, it forgets to have a fun vibe, and the pace is slower than freakin’ molasses. Sadly, this is what we refer to as a “Lacktion” movie. The dearth of actual action – presumably why viewers are watching Kill Line to begin with – ultimately kills Kill Line. Audience members are shown a classic barfight (with some MAP’s – Middle-Aged Punks), which sets up Kim as a guy with good fighting skills. Unfortunately, it appears he IS afraid to use them. Viewers are tantalized and then left hanging. That’s a no-no. There is a weak car chase, some weaker gun-shooting scenes, and then somehow we’re at the final battle. It seems drama and dialogue scenes took up the majority of the running time. Not that that would be such a bad thing in another kind of movie, of course, but this is KILL LINE. We wanted to see some…KILL LINE. Perhaps most frustrating of all, it’s never explained what the term Kill Line means. If it refers to the line readings of some of the actors, that could work, because there are a bunch of funny ones. When a movie relies on the unintentional humor of that and some amusing racism by the local yokels, you’ve got a big problem on your hands. Interestingly, the evil sheriff at odds with Joe strongly resembles Christopher McDonald. This wouldn’t be interesting in and of itself, but the original Christopher McDonald stars in Best of the Best 3 (1995), which shares a lot of similarities with this movie. Probably just a coincidence, like how the baddie underlings in the movie are named Mark and Paul, but Gosselaar is nowhere in sight. This may seem like we’re stretching, but that should show you how empty Kill Line is of things of noteworthy mention. It's tragic but Kill Line doesn't come anywhere near fulfilling its potential. A true wasted opportunity, Kill Line doesn't deliver the goods.